Illustrator Hanna Karlzon brings her Scandinavian winter to you with this collection of woodland creatures, ornate ornaments, reindeer on tiptpoes, swirling snowflakes, and more. Winter Dreams postcards are meant to be colored and shared: send them in the mail or frame them on your wall. 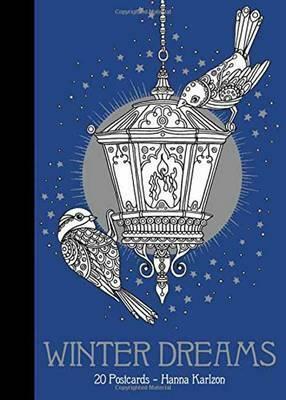 Complete your collection of Hanna Karlzon coloring books with Daydreams, the hardbound, 96-page edition, and Hanna Karlzon's newest 96-page hardbound coloring book, Summer Nights Coloring Book. Also availble is the Daydreams 20 Postcards and Daydreams Artist's Edition, containing 20 oversized art card drawings, perfect for expert and budding artists alike.